I write this to remind mySelf how I want to BE in the world, how I want to relate to others and how I want to serve. It has been a year of much struggle in which I wanted but wasn’t always able to be this brave spiritual warrior. I am still a work in progress with much to learn. Within hours of my beginning to create this blog, I stepped more fully into and embodied my spiritual warrior (I am keeping that experience inward for 7 days before I share my transformational story) thanks to me following my intuition and the generosity of an earth angel named Talia (thanks Talia!). 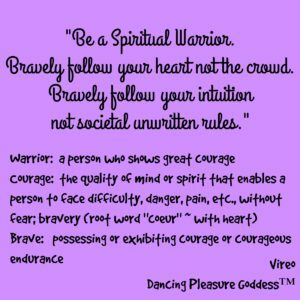 When I started creating the image for this blog, first I used the words “wild woman” but for me sometimes “wild” means instinctual & primal or animalistic. Wild also conjures up more of a survival instinct for me. My best choices almost never come from wild primal and survival is not what I want. For me when I am in primal survival, I am like a wild caged animal. I am usually in fear when I am wild, primal & instinctual. When I come from this place of fear and survival, I often make poor choices that I am later very ashamed of and I often go to ‘fight, flight or freeze’ mode. This last year up until today, has been a year filled with anxiety, shame & fight, flight, freeze mode. So I let go of the word “wild” and a lot of stories. Then I tried the word “badass” which many have been using lately. It sounds playful, a bit rebellious and maybe even fun. I am discovering that looking words up in the dictionary is vital and very insightful. I am sure glad that I did that. Badass seems to invite more fight and being against something. I want to stand FOR something not against things. Remember, law of attraction ~ whatever we focus on, we get more of. Again, I do not want to be a mean troublemaker or intimidate people. I was ok with powerful ~ full of power versus force (love Hawkin’s book “Power Vs Force”). Then the word “warrior” came to me. I didn’t want the first meaning which referred to fighting in war. The second meaning however was a “yes” that works! I added “spiritual” to emphasize the importance of our connectedness to each other. 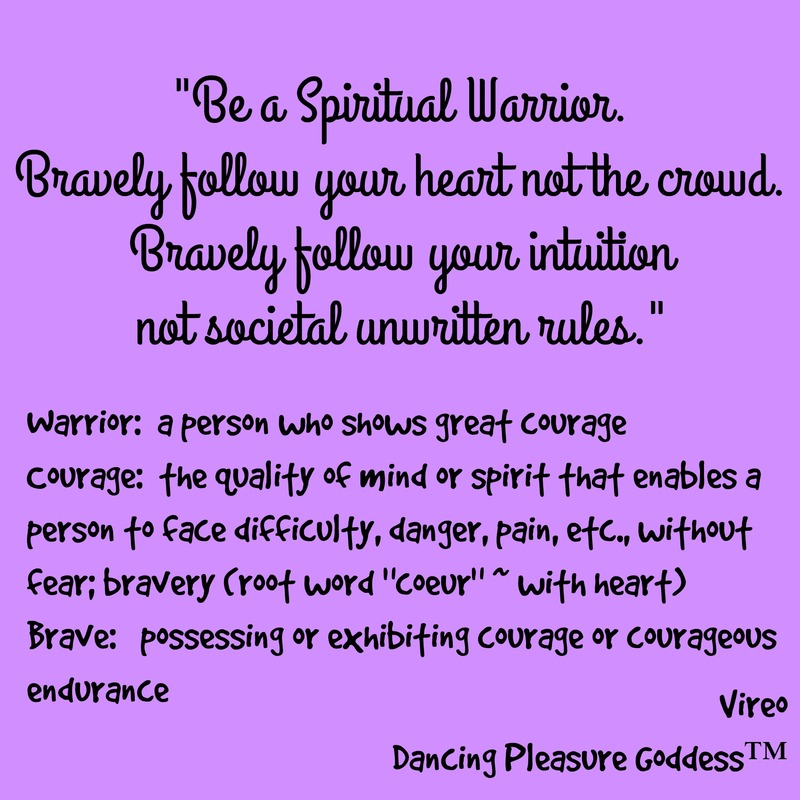 Warrior: a person who shows great vigor and courage. Spiritual: of or relating to the spirit or soul, as distinguished from the physical nature. The last meaning of “spiritual” that I resonated with was: of or relating to sacred things or matters; devotional; sacred (minus the ‘religious’ part). I encourage (“coeur” French word for heart) you, with my heart to check out Stuart Wilde’s talk in the link about. May we each silently offer our blessings to each other as we are in each other’s presence and/or thoughts. I am committed to this. Who else is committed to this practice? Or what are you committed to offering silently to others? Also I would love to hear what words help you to be more conscious, powerful, loving and compassionate ~ all at the same time! I offer you in this moment my compassion, my love, my ecstasy, my non-judgemental, joy, peace and sparkles!